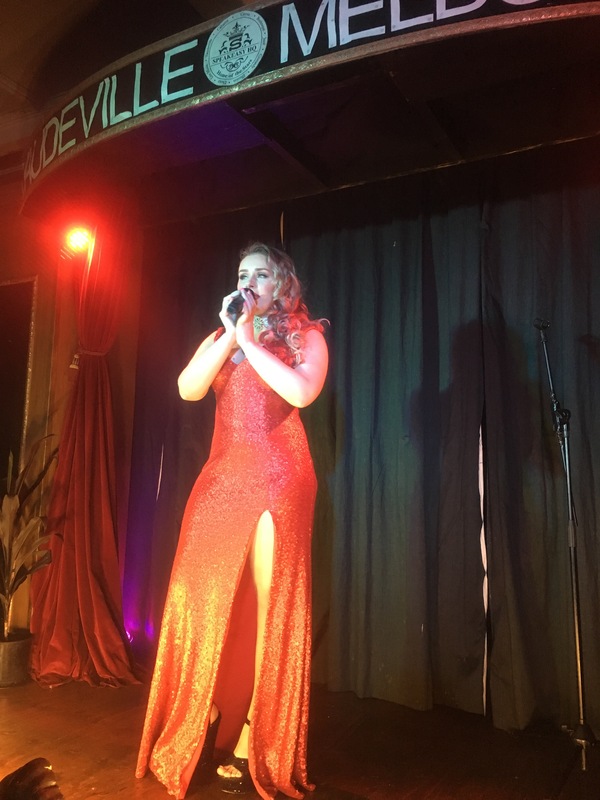 On the final evening of Winter, I ventured out once more after work to the fantastic vaudeville venue in Melbourne – Speakeasy HQ – for an evening of charming entertainment. 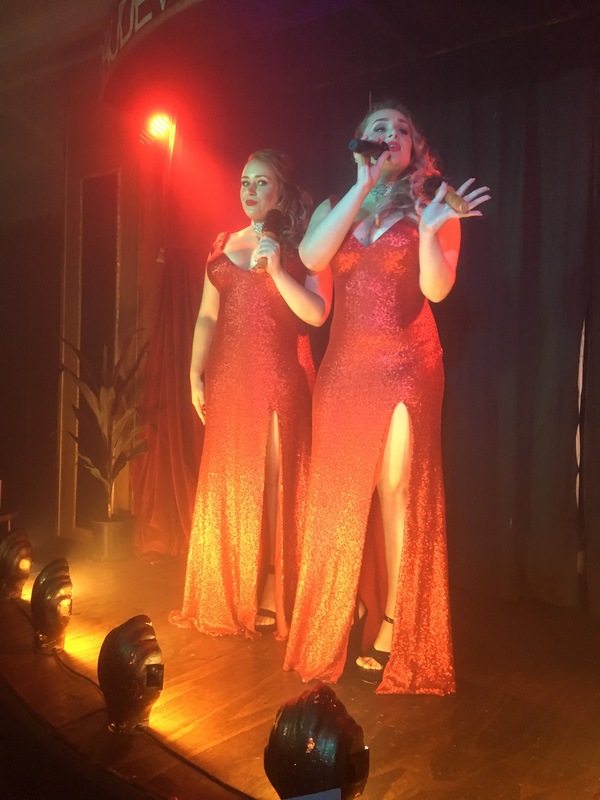 On the evening’s bill were identical twins Amy & Mel Djuric singing a variety of songs, with a focus on those of Ella Fitzgerald. I have been blessed to have previously seen short performances from Amy & Mel, however for those who are yet to see them perform let me assure you that you’re in for a visual and auditory treat! Dressed in matching stunning red gowns with sparkling chokers, Amy & Mel easily commanded the attention of all audience members. Much of this show seemed to be an ‘Ella Fitzgerald Extravaganza’ with Amy & Mel singing beloved Ella classics such as “Summertime”, “At Last” and “Lullaby of Birdland”. If you’re keen on the songs of Ella Fitzgerald or that era of music, then watch out for your next opportunity to see this show! One aspect I enjoyed about this show was that each twin had many solo times to shine on stage, mixed in with some fantastic and entertaining duets. 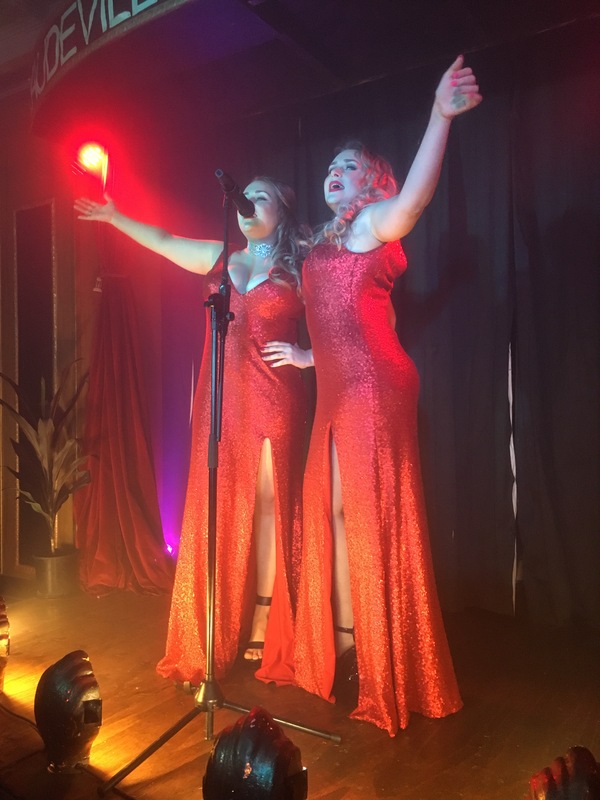 Along with their golden voices, Amy & Mel used the stage well and ensured that the audience were given plenty of smiles, cheeky glances and sassy dance moves. There were times that I could see the joy and happiness shine in Amy & Mel’s eyes during their performances, and they had the audience captivated – many couldn’t take their eyes off Amy & Mel! 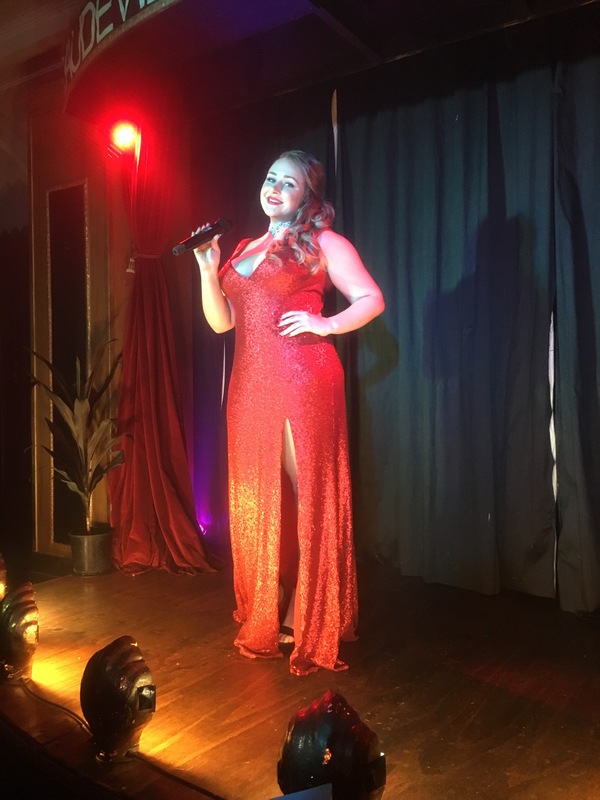 I enjoyed the range of songs performed -classic hits alongside modern songs sung in a jazzy or lounge style. Other songs had a dreamlike, fairytale quality to them. A strength of the show was the different vocal ranges of the twins, with one favouring the high, sweet notes and the other the lower, more sultry tones. Naturally, Amy & Mel played to their own strengths in this area with their song choices. Amy & Mel were playful and sweet at times, then brought all the sass the next moment. Their vocal strengths and song choices made for an immensely enjoyable show. If you’ve never seen singing twins perform then I recommend you go and see a performance by Amy & Mel – yes, they are as adorable and sweet as you can imagine! VERDICT: A splendid evening featuring some enchanting singers and well chosen songs. If Ella Fitzgerald and her era of music are your cup of tea, then you’ll surely enjoy this show. *Disclaimer: I attended this show as a guest of Speakeasy HQ.